The weather was beautiful fall weather until Thursday rolled in. It’s still in the 40s and way better than Syracuse or Chicago, but it’s cold enough to make me extra excited for California (work trip) next week and NM and AZ (vacation) the week after! Having time to cook again is the best. I love it so much! Lately I’m trying to focus on a mix of quick and easy things that can be made after work on a weeknight, and then we might get fancy for a weekend recipe. When looking at new recipes I’m also looking for ones that require fewer ingredients, or very common ones that we have most of at home already. When I get too fancy with the stuff our grocery bill goes wayyyyy up, not cool. Another thing I’ve decided that I’m super excited about is the extremely simple concept of freezing soups! Instead of making a batch on Sunday and then eating the same soup allllll week, I now have a mini stash of frozen pint sized jars full of a couple different soups! So when I make a fresh batch, we enjoy that for a day or two, and then freeze the rest and pull a couple jars out of the freezer for the rest of the week. I don’t know why I didn’t think to do this sooner! Preheat oven to 425°F. Heat a medium pot of salted water to boiling on high. Cut off the tops of the dumpling squash, then use a spoon to scoop out the seeds. Place the squash and their tops on a baking sheet, cut-side up. Drizzle the insides with a little olive oil and season them with salt and pepper. Turn the squash cut-side down and roast in the oven 30 to 35 minutes, or until browned on the outside. While the squash roast, wash and dry the fresh produce. Peel and mince the garlic. Roughly chop the parsley leaves. Small dice the red pepper, eggplant, and zucchini. Add the millet to the boiling water and cook 18 to 20 minutes, or until cooked through. Drain thoroughly (this is key) and rinse with cold water. Transfer the drained millet back to the empty pot it cooked in. While the millet cooks – In a large pan, heat some olive oil on high until hot. Add the eggplant, red pepper, zucchini, and garlic. Season with salt and pepper and cook 3 to 4 minutes, or until softened. Add the sugar, vinegar, and half the parsley. (Reserve some for garnish.) Cook 1 to 2 minutes, or until the sugar is dissolved. Transfer the capontata to the pot with the drained millet and stir to combine. Season with salt and pepper to taste. Carefully fill each squash with as much of the caponata mixture as possible. (Reserve any extra filling for serving.) Sprinkle a little goat cheese over the top of each. (Reserve some cheese for garnish.) Roast 7 to 9 minutes, or until the squash is completely tender when pierced with the tip of a knife. Divide any remaining filling between 2 plates. 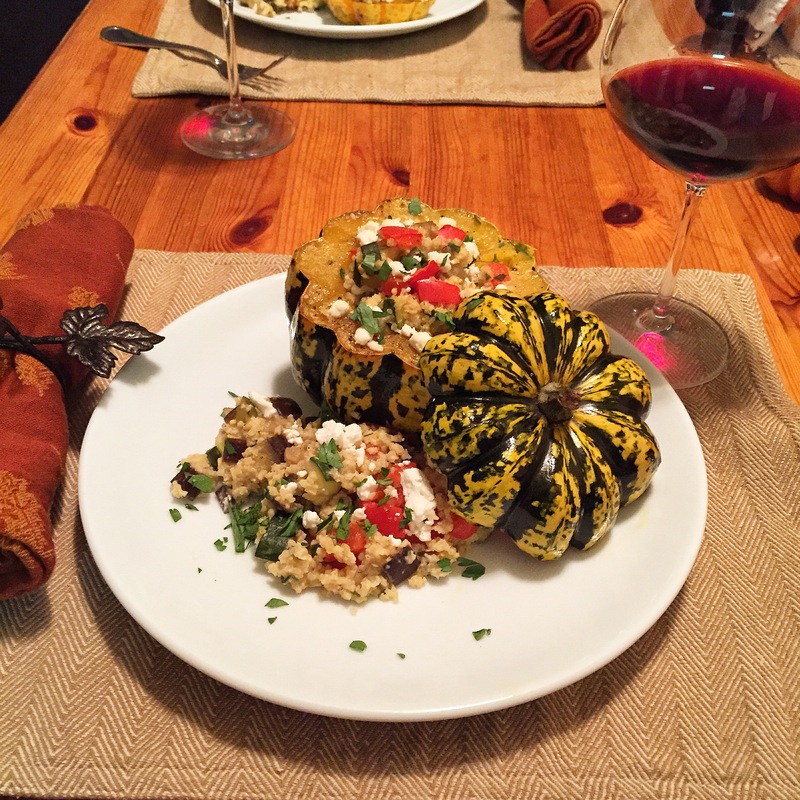 Place a stuffed squash on each plate. Garnish with the remaining parsley and goat cheese. Bon Apetite! Preheat oven to 350. Coat a 10×15 inch baking dish with non-stick cooking spray. Add 3 large beaten eggs and 2 cups canned pumpkin; beat well. 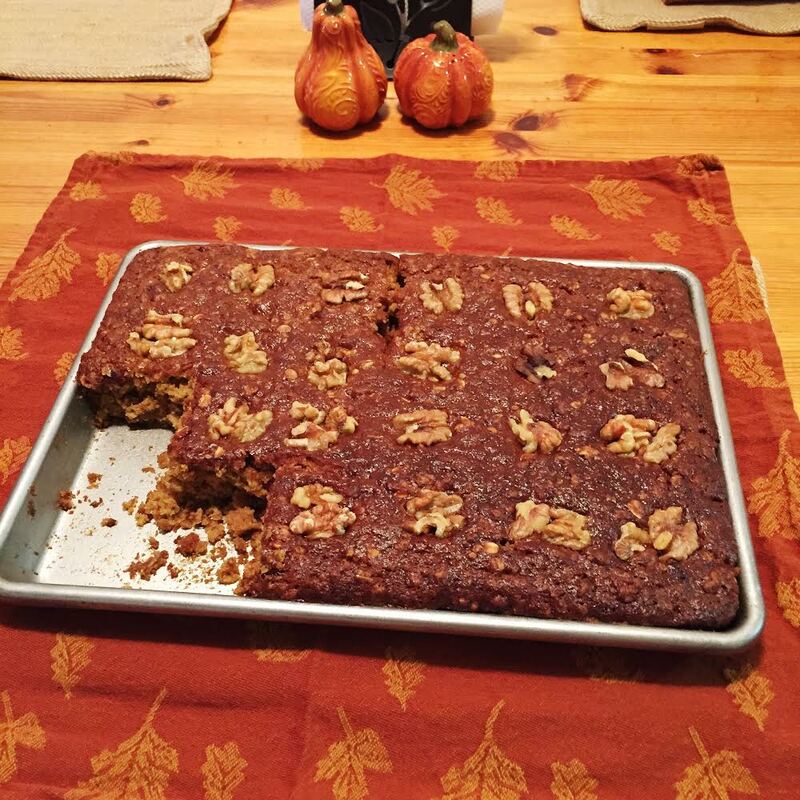 Add ¼ tsp salt, 1 tsp pumpkin pie spice (or more if desired, I did between 1 ½ and 2), 1 ½ cups flour, 1 ½ cups quick oats, and 2 ½ tsp baking soda; mix thoroughly. Bake until a toothpick inserted into the center comes out clean, 40-45 minutes. Brown ground beef in a large pot. 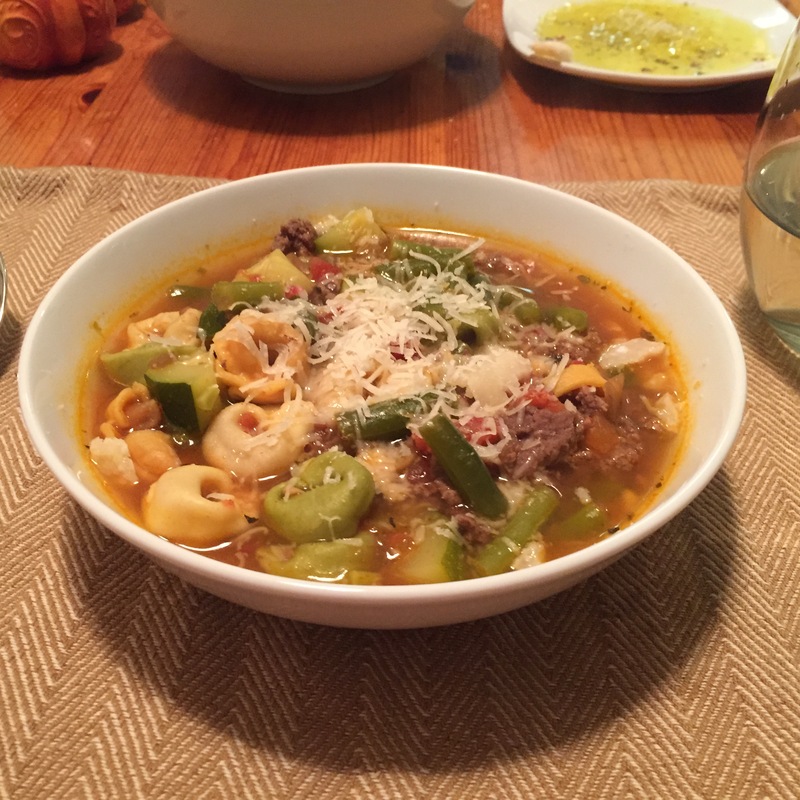 Add the remaining ingredients except tortellini. Bring mixture to a boil and simmer about 20 minutes. Add the tortellini and cook until tortellini rises to the top. Normal life is the best. Another week full of time to work out, catch up on TV shows, and not being stressed out about work. On Wednesday I took the day to volunteer with a couple of coworkers at Junior Achievement’s Finance Park facility. This place it the coolest. A group of 8th graders (like 150 of them) come and learn about money and budgeting. They get a life scenario when the arrive, it tells them their occupation, gross income, family situation, credit score and other stuff. Then they get to see how much the pay decreases after taxes. And then they have to budget for 18 different things – groceries, health insurance, school loans, entertainment, rent…. It’s great. They should make college students go through that place. 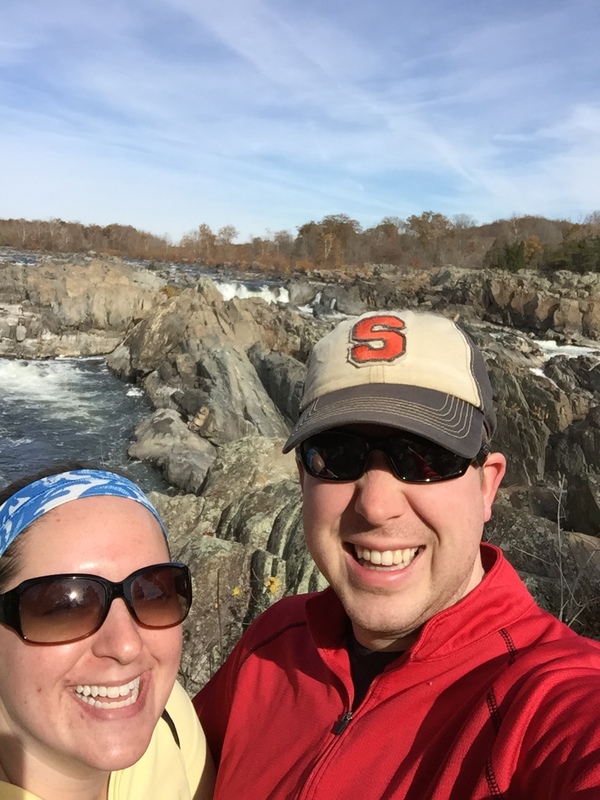 Saturday we went to Great Falls State Park for a little hiking. It was 5-10 degrees colder than I’d want it to be but once we got moving it was fine. It was really nice, I had no idea this place was so close to us. Apparently the river is a training place of the olympic kayaking slalom team. Andddd I recently found this article so next time we might have a buddy with us! 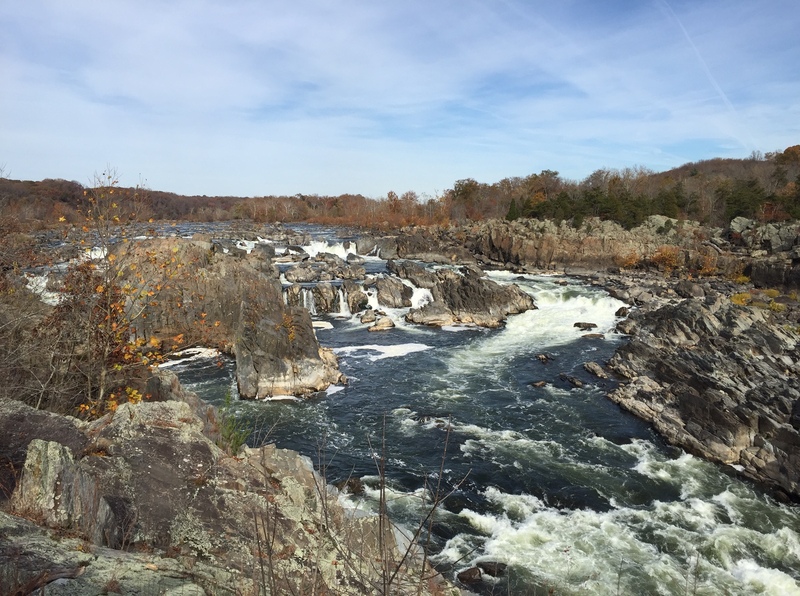 And next year I’ll probably insist on this hike a week or two sooner. The fall colors were still pretty, but the trees would have been fuller a week or two ago. So yeah, a pretty neat place and a good use of a Saturday afternoon. This week we finished up our blue apron delivery with Congee & Caramelized Pork. It was pretty delicious but not something I’d seek all the ingredients out to make it again. 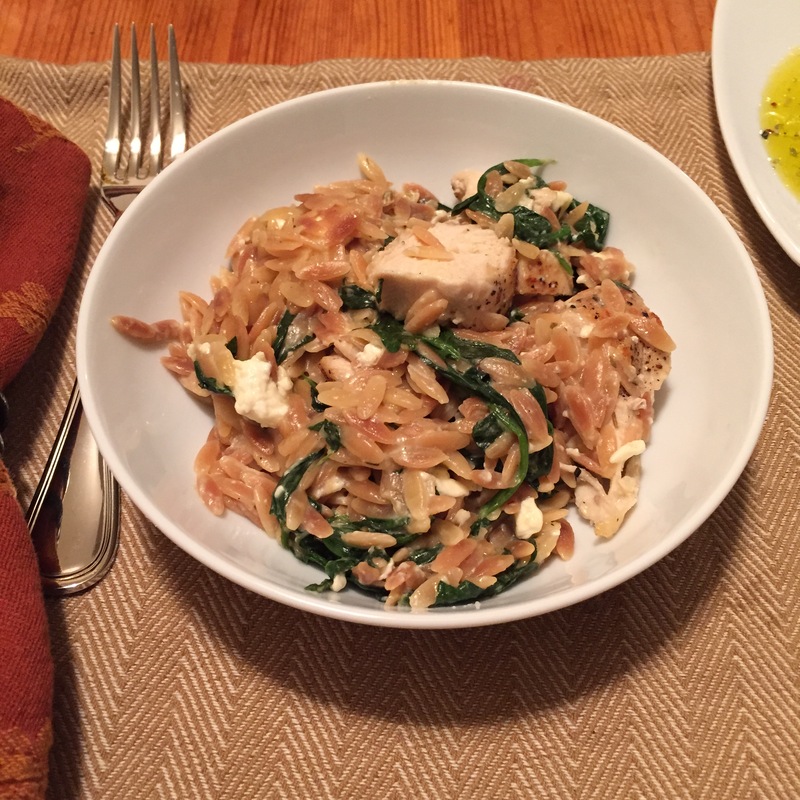 For our normal new recipe for the week we made Chicken Orzo with Spinach and Feta. This was from a cookbook we got as a wedding gift – America’s Test Kitchen’s The Complete Cooking for Two Cookbook. We doubled the recipe so there’d be leftovers so everything below is doubled. But cut it in half if you want something just for two of you! Since the recipe was doubled I used our skillet with taller sides, instead of the standard frying pan, and it was the perfect size. Very little prep work for this one, so that was nice. Took about 25-30 minutes all together. The recipe was delicious with little prep work, I’ll definitely make this again. Toast orzo in a 10 inch non-stick skillet over medium-high heat until golden brown, 3-5 minutes. Transfer to bowl. Pat chicken dry with a paper towel and season with salt and pepper. Heat 2 tsp oil in the now empty skillet and heat just until smoking. Brown chicken lightly, 3-4 minutes per side, transfer to plate (will finish cooking chicken later). Add remaining oil, garlic, oregano, and red pepper flakes to the now empty skillet and cook until fragrant, about 30 seconds. Stir in broth and toasted orzo. Nestle browned chicken into orzo, add any accumulated juices, bring to simmer. Reduce heat to medium-low, cover, and simmer until chicken registers 160 degrees, 10-12 minutes, flipping chicken half-way through cooking. Transfer chicken to a plate, brushing off extra orzo. Continue to cook orzo until al dente and creamy, 2-5 minutes, stirring in additional broth, 1 Tbsp at a time, as needed to loosen consistency. Stir in spinach, until wilted, about 2 minutes. Stir in feta and lemon juice and season with salt and pepper to taste. 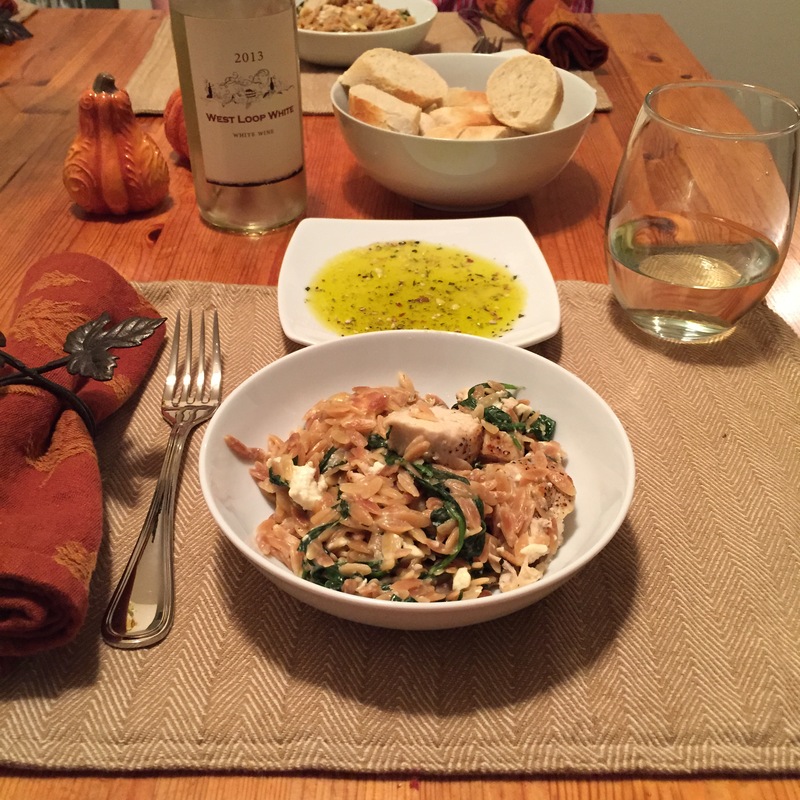 Serve chicken with orzo. 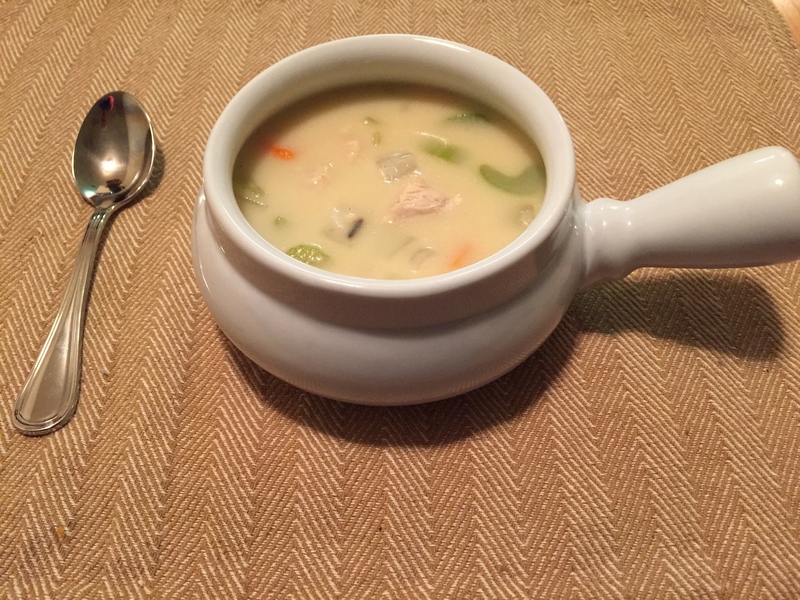 Week 15 – Creamy Chicken and Wild Rice Soup + Blue Apron week! Another fabulous, not working over time week. Man, having normal working hours and taking full or half days off on Fridays is the way to go. We went to our friend’s house on Friday night for dinner and hanging out while the kids came trick or treating. Saturday was my first real Saturday since busy season ended and it was great. 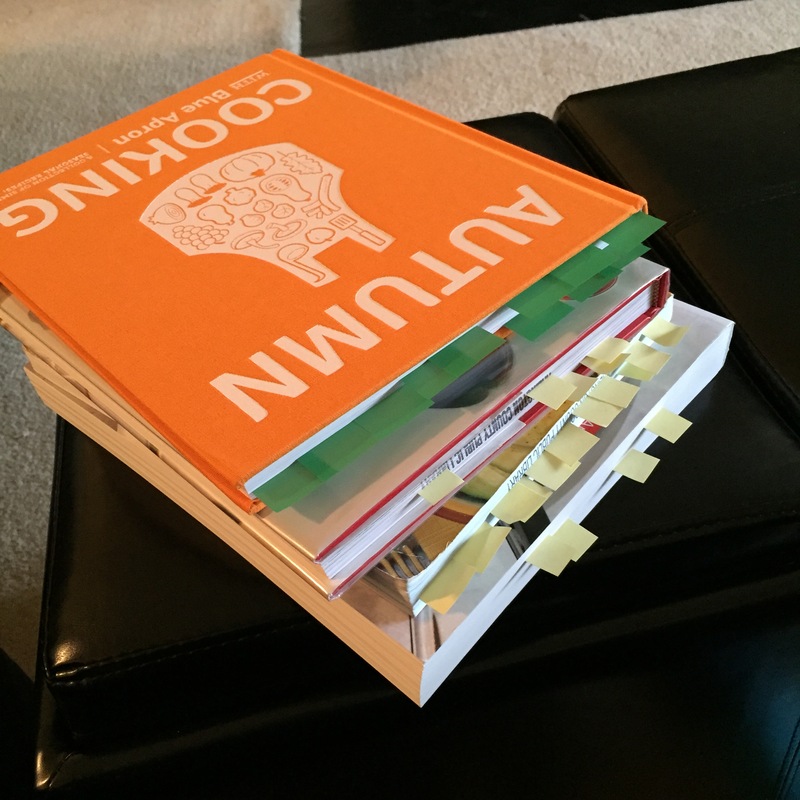 I wore sweats all day, went through some cookbooks (got the Autumn Blue Apron book this week! ), went to pure barre, and did everything at my pace. Matt’s friend Mike was in town this weekend so he and James came over for pizza dinner – Matt made some top notch pizza, as always. And then I got to stay home and watch a girly movie while they went out to a couple bars. It was great. This week we brought dinner to our friends who had a baby a few weeks ago and since the weather is getting chillier we thought, what a better thing to bring than soup! So, at Matt’s suggestion, we got out the recipe book that a bunch of lovely women compiled at one of my bridal showers and made this delicious soup recipe that his mom added to our book. It is amazing and I already want to make it again since we gave most of it away! This recipe was also perfectly timed as I had just read this blog post about making a great soup and this recipe had all of the things it talked about. We also got a blue apron delivery this week. So far we’ve made the Pan Seared Salmon and the Greek-Style Braised Chicken Thighs. The salmon was pretty delicious and the simple side salad of beets, chives, brussel sprouts, and shallots was amazing and something I’ll definitely be making again. I didn’t have any of the horseradish sour cream but Matt said it was good. I forgot to take a picture of that one so just imagine it looks like the one in the picture. The Chicken thighs were great in theory – really great combination of flavors that I never would have chosen to try on my own, I just am not a huge fan of chicken thighs with the bone in it and the skin on it. Again, forgot to take a picture but it also looked pretty much like the picture on Blue Apron’s site. 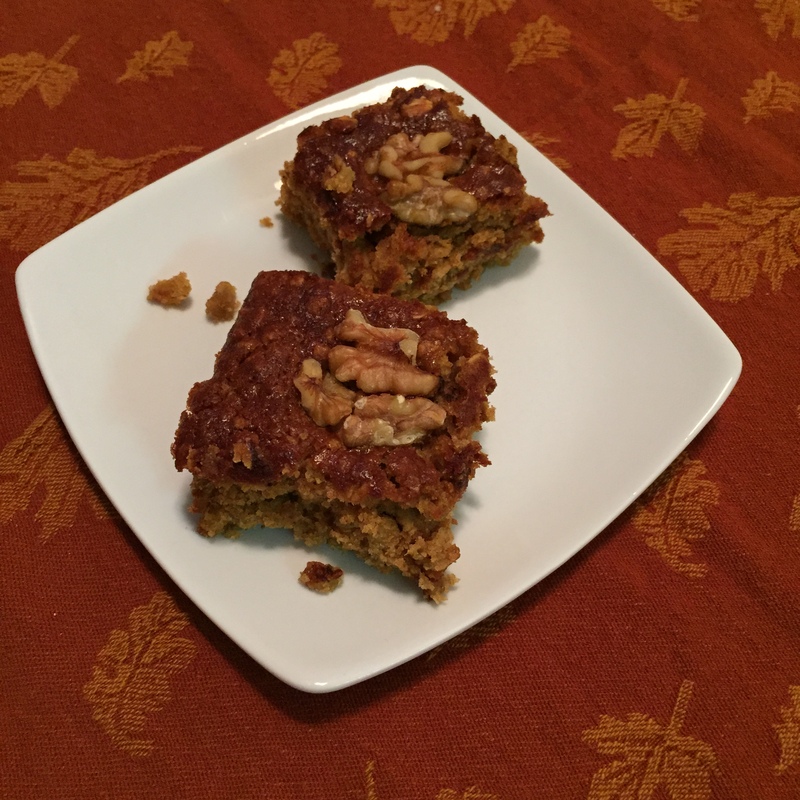 And update on those granola bars from last week – they’re freaking amazing! I need to make more of those asap, they were great to have around in the fridge for the week. In a large saucepan, sauté the onion, carrot, celery, and garlic in butter. Stir in flour until blended. Gradually stir in broth. Add the cooked rice, chicken, salt, and pepper and bring to a boil. Reduce heat, cover, and simmer for 10-15 minutes or until vegetables are tender. Reduce heat to low and stir in the milk, lemon juice, and wine. Cook and stir for 5 minutes until heated through.